THE RAMA TREE is an acronym for THE RESTORATION: A MILLION ACTIONS TO REJUVENATE EARTH’S ECOSYSTEMS is a non-profit educational organization centered in Waimea, on the Big Island of Hawai’i in the Polynesia/Melanesia biodiversity hotspot. The Hawaiian Islands are the most remote lands on Earth. Tragically known around the world as the endangered species and extinction capital of the world, Hawai’i has lost over 90% of its original habitat. According to the DLNR (Department of Land and Natural Resources) Hawai’i has lost an estimated 90% of its dryland habitat, 61% of its mesic habitat, and 42% of its wetlands. Today, native vegetation occurs over less than 40% of the islands' land area. There is great work to be done to restore the forests that provide our fresh water, keep it pure, hold and build the soil, store carbon, protect the reefs, provide half the air we breathe (the ocean provides the other half) and keep the climate in the realm of Paradise. Throughout time, art has been effectively used to inspire awe, deepen understanding, and catalyze positive change. More than any other human power, art and imagination can be life changing. Art can awaken a dynamic force for change -- our innate love of life. It is only when we cultivate hope in the hearts of the people and they feel the potential of a healthy abundant life for themselves, and their children that real change occurs. It is our intention to touch the hearts and lives of millions of people worldwide and help create a renaissance of art in service of life. 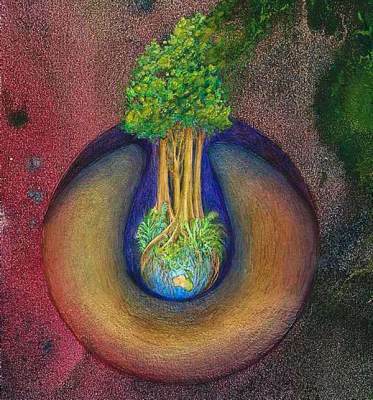 The Rama Tree supports the HALF EARTH PROJECT (also known as NATURE NEEDS HALF) toward the preservation, and restoration of half the Earth and half the ocean in order to support a healthy living world ~ our life support system. The Rama Tree is fulfilling its mission through the dynamic integration of art, ecology, and education to spark action in the people at home, in schools, neighborhoods, and bioregions around the world. As Jane Goodall reminds us, “The most important thing we can ever do is realize that everything we do matters.” Scientists and policy makers agree that our primary task toward this end is education and the blossoming of ecological literacy. The Rama Tree will reach young children, who innately love wildlife, as well as teens, adults, and elders. The children in turn will influence their parents and teachers. The main projects and programs will be piloted on the Big Island. Our job is to “change the dream” of the modern world. The indigenous shamans and elders …teach that “the world is as you dream it.” The dream we have had in the modern world, they say, is a dream of more – more factories, more companies, more freeways, more houses, more money, more buildings, more cars, more everything. The wise indigenous elders and shamans point out that that dream is now becoming a nightmare rippling across our great Earth, and wreaking havoc. To many it feel's like the Earth's finite resources are declining so fast that we must compete in any way and at any cost. From that view the world is governed in a way that fewer and fewer people have a real chance to win. Indigenous wisdom explains that we live through the dream we have of our future, and we cannot change our actions and our habits without changing our dream. What we do will always be in accordance with our dream. The elders state that we can change and uplift the dream within one generation. That’s really good news. Once enough of transform the dream to one filled with abundance, beauty, peace, and prosperity and we connect with each other, it will manifest in reality. Increasing awareness, we can build a dream of respect, harmony and stewardship of the natural world and each other. In this dream, there is enough great work to satisfy the gifts, talents, and passions of every person on Earth. No one will be left out. We will build a dream based on state-of-the-art agricultural, energy, technology and transportation systems with magnificent green buildings covered with living walls, rooftop gardens, and infrastructures teaming with native and edible trees, plants and wildlife, and have a positive impact on nature and humanity. This is an attainable, sustainable dream of great power and beauty that will benefit everyone. Let’s build it. Your tax-deductible contribution to THE RAMA TREE will help Calley and The Rama Team move this organization into full fruition. No contribution is too large or too small. We request and welcome your financial support, your time and energy, your counsel and recommendations to patrons, benefactors and non-profits with similar goals. ribute.